Somehow the weather gods overseeing the northwestern part of Nevada have decided to entirely skip the season the fall, making great headway for winter. Therefore, these photos are a product of me looking out the window at cloudy skies and shivering at the prospect of stepping one over-the-knee sock covered foot outside. In fact, this entire outfit was literally too skimpy to wear today. So skimpy, that I left for part of the morning to run and find some socks to cover my legs. Oh, fickle weather. Where did all the 65-70 degree days run off to? As for these shoes, I'm a bit uncertain as to how I feel about them with this outfit. The inner let's-wear-black-shoes-with-everything side of me screams I should have grabbed my Aldo wedges this morning. But then there's this little voice that secretly wanted to wear these tan peep toe boots just for the sake of wearing them. What do you guys think? Does the color of them throw off the outfit? augh your shoes are sooooo cute! Another amazing outfit at a great price. Girl you rock at that!! i hope they still have that top for sale because i want it! and those shoes! you look lovely! 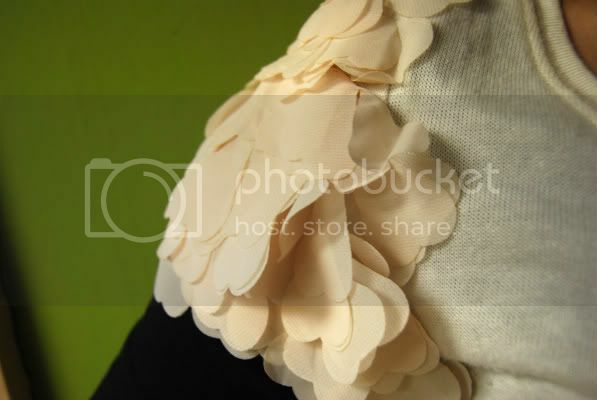 Wow that ruffle sleeve is so beautiful!!! I am IN LOVE with this outfit! I can't get over the fluttery sleeve blouse. And the shoes are perfect with it. They really tie together the light and dark elements of the look. i love shoes, top and necklace, great! Those are fanTAStic shoes!!! Stay warm, dearie! i cant compliment you. only because EVERYTHING compliments everything else soo well!! that's funny--i totally know what you mean about the shoes. (though on a suburban, far-less-fashionable level.) sometimes, when i put an outfit together, there are the accessories that i KNOW go well, but then there are the accessories that i FEEL go well. i think that's the difference. going with your gut's instinct or your head's knowledge. anyway, i think the shoes work! the black wedges would've looked great too, but the tan boots make more of a statement. Black shoes would have made a nice long line, but I like the unexpectedness of the lighter shoe--that's why we all read your blog! You are having fab hair in that last photo. That shirt is essential to my closet. I will not be happy until I own it! This is such a great look. The boots are awesome. I have that same voice that tells me to wear black shoes at all times (almost) but it's good to push yourself out of that. It looks great! I really love the color of shoes with this look....I think it is middle ground between the black dress and girly top, and it balances it really well! LOVE how you styled the top with the bodycon dress underneath! 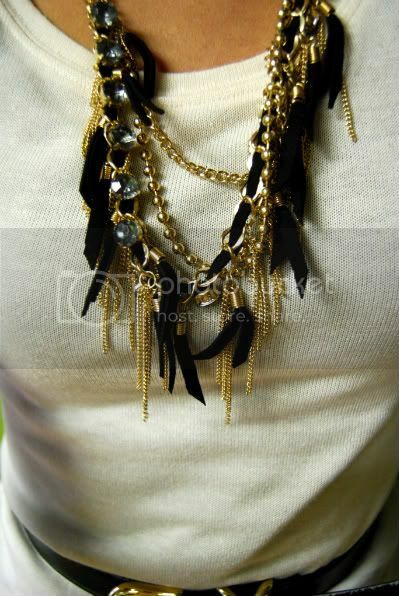 The details of the necklace and the top are kuh-illerrr. I know what you are talking about. I too suffer from alwayswearblackshoesitis! I do think the shoes you have on are very cute with your outfit though. ahhh. the sleeves are awesome. i'd wear those ruffles on my head. as for the shoes, they're a little out of place. but maybe i'm just biased for black shoes. I'm in Southern California. And I too have been wondering where Fall went. You look amazing! When I first saw this outfit I was sure it would be composed of expensive pieces, but now I want that shirt and necklace!!! You are so creative! I love the way you layered a shirt over a plain black dress. The result is very sophisticated! Dude, your outfits have been prime lately! I am so jealous of that flutter sleeve top, it's perfect! I can't believe the weather I've been hearing about in your neck of the woods! Amazing outfit!! Love that ruffled top. You look gorgeous! Wow! F21 is on fire! I love that top and that necklace! Wonderful styling. You look fantastic! HOLY cow! i thought you were going to say that your entire outfit was designer stuff and way out of my price league! nice work! it all looks fantastic, and yes the shoes are daring, but you totally make them work! I love the outfit! So nice!